Liverpool prices stayed the doldrums until June 2003 when the city won it’s bid for the 2008 European Capital of Culture. Prices immediately started rising at about 2-5% a month and have continued on this trajectory since. Liverpool’s population of about 1,100,000 has been in decline for decades – the migration away was caused by high unemployment, diminished employment prospects after heavy industry and manufacturing declined, compounded by Liverpool’s importance as a port receded and most of the docks closed. Much needed investment in the 1980s and 1990s went to its slightly bigger neighbour Manchester, particularly the banking and service related employment. Liverpool’s reputation was also tarnished by heavy-handed trade union representation in the 1970s-80s. Promises of rejuvenation after the mid 1981 Toxteth riots led to little – the city’s hosting the European Garden festival led to the construction of the coastal garden festival site which fell idol. Things are changing fast though. Of particular importance is that the city population has now stabilised and is flat whilst unemployment has dramatically dropped to 5.3% since early 1980s when some estimates were as high as 25%. The Duke of Westminster is investing heavily to transform the Duke Street warehouse area of Liverpool into a high quality shopping and arts district, complete with private security that will have powers to eject any unruly or anti-social people. Many warehouse apartments are being built close to Liverpool’s China town – this is a serious development which I would envisage will lead to substantial price increases in the immediate area in the next five years. The North Docks are beginning to be re-developed – many of the large warehouses have plans for conversion into loft apartments. Their proximity just north of Liverpool city centre and the Mersey waterfront is attractive to professionals working in the city. The South Docks have had extensive development since the late 1970s – the secure access of these semi-gated developments has attracted many investors and this area with its marina is quite mature. The city has an expanding University population – student numbers have increased considerably in the last 15 years. Liverpool University is now 19,400 students with John Moores 20,000. Both Liverpool University precinct and Liverpool John Moores University are fairly central city locations, mainly in the Rodney Street to Mount Pleasant area. Many of the students live in the south at halls of residence on the southern side of Sefton Park and further west in the Rathbone area of Aigburth. Students that live outside halls of residence tend to live in many different parts, but the nicer areas of Allerton Road and SE end of Smithdown Road are popular. Many investors have snapped up cheap terraces in the last year and there threatens to be a flood of student property on the market, so watch out before you enter the fray. Unlike Leeds and Birmingham, there is no one obvious “student housing area” – be careful to be either very close to the universities themselves or in the fashionable Sefton park area if you want to attract students – thorough research is important and yields will be far lower in the nicer Sefton Park area. The rental market is strong with rents quite reasonable – because property is so cheap (say 65,000 pounds for a 4 bedroom house) yields are very attractive. To reduce void periods to a minimum you need to make sure you pick the right type of property in the right area – convenient for where students wish to live and where the market is not saturated – you’ll need the advice of local letting agents for this. Liverpool Airport is some 8 miles south of the city centre in the Speke area. It was named John Lennon Airport some time ago and prides itself in being the fastest growing airport in the country. This airport has low cost flights to London, other UK cities and mainland Europe. Liverpool is at the end of the M62 motorway that runs to Manchester and Leeds. The M6 south is about 15 minutes drive. Traffic in the city is relatively light when compared with most large cities although the L1 city centre can get congested from time to time as can the Wallasey and Birkenhead Tunnels taking traffic to the Wirrel. Frankly, not that much has happened in the last twenty years, but re-generation has all of a sudden accelerated dramatically now that the city has won the European Capital of Culture bid and the Duke of Westminster’s big development has been launched. Investors from all over England and Ireland have arrived in force, so expect considerable competition for the best properties. Also note that because Liverpool prices have risen so much in the last year, many locals are re-financing their properties and buying buy-to-let investments. They all seem to be “on-the-make” – who can blame them! You need to fight hard to get the estate agents ear – make sure you can prove you are a serious investor and you will get more attention. Georgian and Edwardian Terraces: Liverpool has many magnificent architecturally merited properties. Examples are the Georgian terraces around Upper Parliament Street, Hope Street and Grove Street – most have been renovated and all are now listed. Interestingly, much of the architecture is intact because the council years ago could not afford to demolish the empty buildings – they then became listed meaning they also could not be demolished. This provides developers who specialise in regenerating old historic properties huge opportunities. Refurbished apartments in such terraces are selling for up to 250,000 pounds now. Other areas are Victorian 2-up-2-down terraces in narrow streets where crime can be a problem. Such terraces can still be purchased for as little as 30,000 pounds, but this is a high-risk approach – and many tenants may not wish to live in such streets. The middle market has seen the biggest advances – 4 bedroomed terraces in average areas – prices have gone up 50% in the last year and it seems there is still quite some way to go. There has been some new housing in the 1980s and 1990s in fairly central city locations, on land where previous terrace housing was demolished. These small 2 and 3 bedroomed private terraces have become popular with professionals wanting a family home but in a central location. A good example is the small estate just a ¼ mile south-east of Duke Street – I would expect prices on this estate to rise considerably as the Duke Street development progresses. Unemployment in Liverpool has been a problem for the last 50 years, but the problem is rapidly disappearing. The unemployment rate for Liverpool is now 5.3% (the same as Birmingham) though Granby at 13%, Vauxhall at 11% and Speke at 9.4% are high unemployment outliers in a city that has done well in the last five years. Granby is the area just SE of Duke Street, whilst Vauxhall is better known as Bootle. However, the 5.3% is still double the UK average of 2.6%. 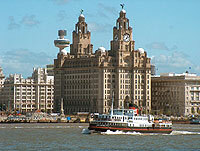 Many call centres relocated to Liverpool to take advantage of the excess of workers and lower wages. Other financial services and government jobs relocated to Liverpool and unemployment rates have tumbled – with this, house prices have increased because demand has risen and supply has remained fairly static. For the middle to lower end of the market, I would envisage this to stay a familiar trend for the next five years. Two big exposures Liverpool has is call centres moving to India, and the Halewood Car plant south of the city - where they make Jaguar cars - maintaining production. By early 2003, the low Liverpool property prices were beginning to look a bit ridiculous. Along with say Hull, Stoke and Middlesbrough, prices looked particularly cheap. But Liverpool has the advantage of being on the coast/sea with a lot of history and interesting property and a large city population. It needed the successful 2008 European Capital of Culture bid to kick things off in earnest. If you compare Liverpool to its neighbour Manchester (see house price charts). , it is some 5 years behind on the growth curve. If employment and business move into Liverpool like they have in Manchester, there is not much reason why prices cannot be fairly close to Manchester prices in say 10 years time. If you “trust in Liverpool” then you could realise this opportunity. If you are more cynical and think “I’ve heard it all before with Liverpool”, then may be this is not the place for you to invest, and you can be better off investing in somewhere you “believe in” more. I favour the area in Liverpool immediately to the south of L1, just south-west of Duke Street. The area is a mix of Victorian terraces, open areas where houses have been demolished, 1950s-1970s flats and 1980s small houses. The area sandwiched between the South Docks and Duke Street and close to the expensive areas of Hope Street seems ideal to capture opportunities presented by the European Capital of Culture. Just west of Berry Street and China Town is a prime up and coming area. Slightly further out, south of the Mersey side of Parliament Street also looks good. If you are looking for an established “posh” area – the fine Georgian and Edwardian terraces between Grove Street and Hope Street are very fashionable though prices have quadrupled in the last five years in many of these streets, so it could be a bit late. If you prefer a more up-market area, the district at the Sefton Park end of Princess Road is already very nice and could command prices on par with Edgebaston in Leeds shortly. At the southern end of Sefton Park, parts of Aigburth area have always been very nice and coming up fast. Any area in L2, L3 which is very close to the city centre is worth looking at as well – either flats or terrace houses. For riskier areas where capital prices could move up rapidly, Everton and even Bootle warrant a look, though I would prefer focussing on more central areas. I frankly cannot see prices ever coming down in Liverpool and would not be at all surprised if they went up on average about 1-2% a month for the next year (mid 2004 price increases are about 1% per month). If you can find good tenants and the market is not saturated, then you will likely do well. The city would probably suit investors who already have a portfolio and can handle more risk – buying a 3 bedroomed terrace just south-west of Duke Street looks like a winner – you might even get views of the Mersey if you look hard enough.